My Thundershirt came over the weekend. My jury’s out. Her’s is, too. Here’s what it looks like unfolded. It’s nice fabric. Sort of thick T-shirt material with lots of stretch. I believe they call that “spandex” of some kind. Who knows. This is me while the vacuum cleaner was running upstairs. (The “bad machine” is what We call that thing.) I hate it. 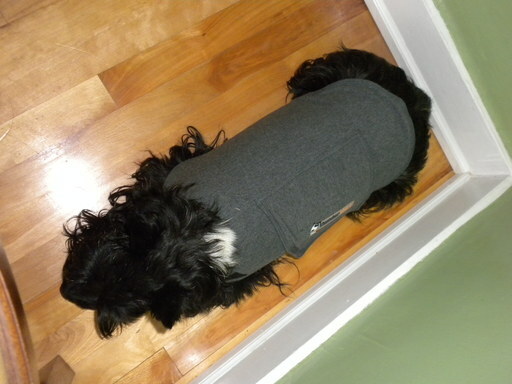 And while I can’t say that I was any calmer in my Thundershirt, I wasn’t any worse. I still hunkered on the floor, beside Her chair. Loud noises make me crazy. How I wish I could Remain Calm and Carry On. 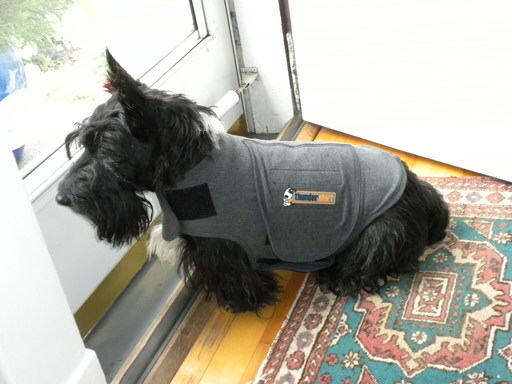 This entry was posted in The Scottie Chronicles and tagged dog anxiety, dog fear, dogs, dogs and thunder, photography, Remain Calm and Carry On, Scottie Chronicles, Scottie photos, Thundershirt. Bookmark the permalink. 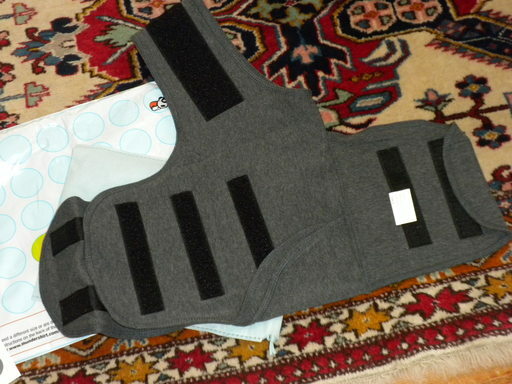 PS – you look neat in your new vest! Stuart – you are so handsome in your Thundershirt! I hope it works for you. I got mine Friday too and when she put it on me all I did was lay down. I didn’t want to walk because it felt weird. She kept picking me up trying to get me to stand up in that thing but it felt better if I laid down. So, let’s hope these things make us feel better when all those bad noises start. Here’s to banning fireworks! Woof!! Well Scout, my friend, I’m glad we have the same feeling in our new Thundershirts! Let’s stay in touch about this! You do look rather cool in that Thunder-Shirt. We could do with a couple over here, but we’ll wait and see what you think after testing it out. The things you do for us Scotties ……. !!! Stuart……..just watched the ceasar milan and he said to actually get used to thunder shirt during calm or happy time…………if you wait to use during times of stress than thunder shirt will just be associated with bad stuff and be basically of no use at all……… 😦 he has a whole video about it if you’re interested. Yes, yes…that’s why I wore it around a few times over the weekend. Once, for a walk. Another – with food on it – you read right. With food on it. (Actually, I wasn’t wearing it with food on it.) The instructions said to “introduce” the shirt as a plate with food because food is associated with good things. We did that, too. And I think I’m going to wear it a bit again today, too. Just so I don’t think it’s a bad thing. (I’m actually not a fan of Ceasar. Don’t know why…I’m just not. Blasphemous, I know. Maybe I should give him another try…). We are not fans of him either you gorgeous dog you and we think we have good reason. He is MEAN!!! He uses dominance and a lot of force and all that stuff that stubborn scotties hate. If you ask us, treat training and everyone just getting along is the best way. We do think he’s right on the lots of exercise front, though….just sayin! We don’t want to ever be less independent than we are…. and our peeps love that about us. Gorgeous? Moi??? I’m blushing…. thank you ever so much! You know, I’m with you on that independence thing. Thanks for the visit! LOL…..I’m not always a fan of some of his methods. But sometimes he does have some helpful hints (like when I used a couch cushion to seperate a food/treat aggressive/bad manners fur friend who was ripping up my little Moo’s Busy Buddy dumbell treat). I just happened to stumble upon a video of him discussing Thunder Shirts..and it seriously made some sense. I so hope it works for you as I’d love to get little Moo one to maybe help her with her fear of car rides/thunderstorms/any type of beeping noises~but also her fur friend Sammy who’s terrfified of thunderstorms/fireworks & gunshots.But we love treat/cheese therapy! FOOD THERAPY. It rocks! I’ll keep you posted and thanks so much for the head’s up on the video. Gotta pop some corn and watch it. 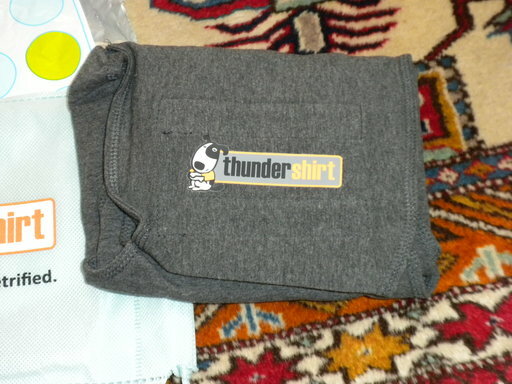 And the videos on the Thundershirt website. Stuart… we live in SoCal and wonder what thunder is? Is it like the Disneyland fireworks and loud booms we hear EVERY night! Fortunately we have gotten use to this.. but we will NEVER get use to Mr UPS, Ms Mailcarrier, the street sweeper and the garbage truck! Sorry… since our mum typed this she forgot to sign our names… Katie MacBrindle and Fiona Vaughn Wheaten.. admirers of Stuart. Oh you guys! I appreciate your visits! And thanks for commenting. Hey…sounds like you’ve got fireworks thunder at your place, too. But, you know what? My Godmother Carol says that thunder is disturbing to dogs, not only because of the noise, but because of the static electricity and barometric pressure changes that come with it. It can literally make long-haired dogs’ hair stand on end! I’ve heard some grreat things from my furiends in my rescue about Thundershirts. I know they don’t work for everydog, but hopefully they’ll help keep you calmer! Mom gave Rescue Remedy to Sid. I didn’t work. Hope you have a great experience with the shirt. Mom will buy one for Sid if it works. You are very distinguished in your Thundershirt. My friend Mikiah is a service dog and his peep is in the band at church and she puts cotton or those foam ear plugs in his ears for band practice and it helps him a lot…don’t know if you’ve thought of or tried that with the storms and fireworks (or the vacuum) but that in combination with the Thundershirt may help. Can’t wait to hear how you do with the next session of fireworks. It doesn’t seem any different than strapping a canine life vest on. I never go into the pool and Kenzie is training for the Olympic swimming team so we never wear them. Kenzie wants to represent Scotland. Good luck with that-next he’ll be wanting a bobsled team for the winter games. Kenzie just told me that his plans for 2014 in Russia are ski jumping like Eddie the Eagle. I think TV will call him Kenzie the idiot because he’ll try a leg lift in mid air. And he’d probably succeed. He’s a terrier. If “on” is the opposite of “off”, Kenzie will accomplish two complete opposites at the same time. The fans will be so pissed off and pissed on that we’ll have to get a letter writing campaign to cheer up Kenzie in the gulag in Siberia. ROFL!!! But what about the surfing? That looks way cool on you, you handsome guy. We need a couple to wear the next two weeks for the NBA basketball finals, The OKC Thunder is playing. Sorry we have not be to see you lately, been busy working on the blogville olymplics for Frankie. I’ll tawdle on over….thanks for the heads up! Me too my talented friend!!!!!!! We hear the thundershirt works like a champ, Stuart, and you couldn’t have gotten it at a better time with thunderstorms and fireworks. We hope it works for you! I’m so glad to hear that you guys! I hope so, too! Stuart Oh Stuart you are all swaddled in you thundershirt. I think it looks like it fits you fine. I have high hopes ~ the theory behind it is sound and it is used for many purposes. It has to be tight to work. I, too, trust the theory behind it. I just need to get used to it so I don’t associate it with bad things. And you know what else??? It’s hot. Oh dear. I hate to be hot. Oh Stuart I hope it works for you. It was the Queen’s Birthday long weekend here a few days ago and some people had fireworks. HOW HORRIBLE!!! My paws are crossed for that peer scared girl. I have a Thundershirt too, Mr. Stuart! I find it hard to jump up on the couch when I’m wearing it, but it is relaxing, especially on chilly days because it keeps my tummy cozy. It helps me sometimes not to be so ankshus. I hope your Thundershirt works great for you! Dillon doesn’t have one, but he is getting a bit hard of hearing, so he doesn’t even notice the thunder anymore! 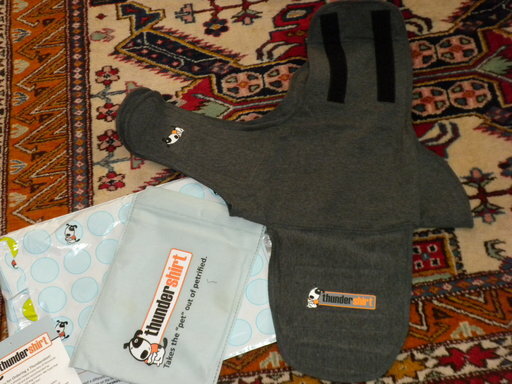 Miss Jackie, thanks so much for sharing your Thundershirt experience. I think I might slip it on sometime today and maybe take a snooze. In preparation for tonight’s NOISE!!! Hope it works. We’d be frightened that that velcro would end up in our fur. We also don’t like clothes. We can’t move! I DON’T LIKE CLOTHES either and, to tell you the truth, the Velcro is worrying my peep, too. We’ll try to keep my hairs out of the way! WONDERFUL to hear! Thanks so much for sharing Zaidie. (And you know we terriers don’t have much patience…..).